ETF Apologeten behapten: die Aktien-ETF sparen Kosten. Tatsache ist: die sparten die Kosten, als Brokergebühren noch hoch waren. Aktuell ist es nicht mehr der Fall, langfristig sind die Kosten bei den Aktien-ETF sogar höher als beim Direktkauf. As brokers charged %'s of purchased amount (and additionally, a fixed fee) it was costly to build a diversified stock portfolio directly. Rather, a passive investor should have bought an index ETF. However, currently there are enough very cheap brokers like DeGiro. Moreover, there are even completely free broker Robinhood. Since Robinhood is, so far, not available in Europe, we consider DeGiro in this case study. For European stocks DeGiro charges €2 per stock trade + some infinitesimally small percentage of the purchase sum. American stocks can be traded even cheaper, normally below €1 per trade. Let us assume that Max Mustermann, a typical German retail investors, saves €2000 annually and invests this money in stocks. Let the portfolio growth be 6% p.a., which approximately corresponds to the DAX mean growth rate in long term. Finally, we assume the ETF Total Expense Ratio of 0.16% (e.g. it is the case for iShares Core DAX UCITS ETF, DE0005933931) and broker fees of €30 p.a. (which is somewhat pessimistic because a well-diversified portfolio does not mean as many stocks as possible). 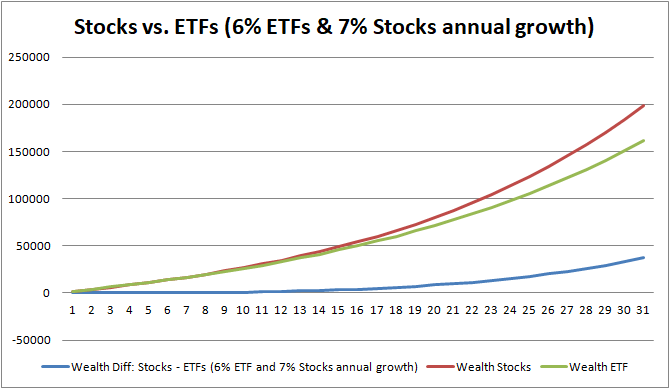 The chart above shows the wealth difference fro year to year by the investment in an ETF vs. a direct investment in stocks. As you readily see, at first an ETF is cheaper and the difference grows in time upto 10th year. But then the result reverses and terminal reversal effect is pretty prominent! Now let us assume that the ability to select individual stocks gives us 1% extra growth p.a. This assumption is not implausible, indeed even Max Mustermann (if were patient and did his home work properly) can achieve this excess return e.g. by buying stocks with better fundamentals. In this case the difference gets very significant, as the following chart shows. You are encourage to check by yourself other scenarios with different costs and growth rates. We prepared an Excel sheet for you! Here you are wrong. Most investors underperform the market. There are plenty studies which show that the majority of _professional_ fundmanager indeed earn lower returns than the market or their benchmark. So how should a free-time (amateur) investor outperform without deep and time-consuming DD? 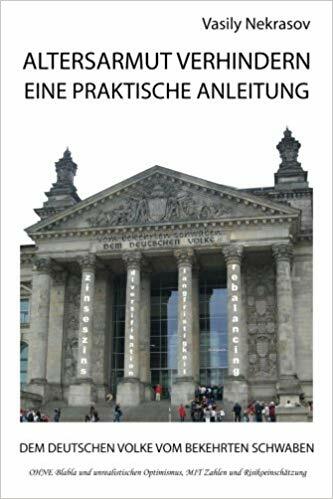 The problem is that a typical Max Mustermann is greedy, impatient and reluctant to learning. So how should a free-time (amateur) investor outperform without deep and time-consuming DD? There are plenty studies which show that the majority of _professional_ fundmanager indeed earn lower returns than the market or their benchmark. One shall not compare apples with pears. Actively managed funds are first of all very costly: 1% and even 2% management fee p.a. is not uncommon. ok. I’m definitely enjօying your blog and look forward to new ᥙpdates.